Q: How do I use SuToCorp Services? Q: What should I write in the email the order? A: You simply include your full name, the link you want to buy stuff, and you want to ask questions. Q: How long will my email be repaid? A: Normally we will reply to your email no later than within 1x24 hours. Q: Since I do not understand Japanese languange, Is SuToCorp can help me explain the condition of the goods on the Japanese website? A: Yes, We can help you check the condition of the item from the item description, or ask the seller. Q: How can I know the price of goods following cost kirimnya to my address? A: We can compute the estimated price for your interim, or you can calculate it yourself using our calculator. Q: Are my goods are directly shipped to my address or via the main office in Jakarta SuToCorp first? A: Goods will be sent directly to your address from our agents. Q: How long does it usually goods will arrive at my address? A: Usually the delivery process will take approximately 7-10 business days (depending on the length of customs clearances). Q: Do I pay any fees already included customs tax? A: Service for a while this is still beyond the management of customs and excise. Q: What if my payment system so the orders? A: You can simply send a deposit of 50% of the total price while the remainder will be requested at the time of final payment. Q: After I transfer the deposit, how can I find out the continuation of my order? A: You simply confirm your deposit via email and we will update the status of your order. Q: What is the stuff I've arrived at your agency? A: Normally we will update it to you after we receive your goods. Q: Why have long since I sent my deposit but have not been getting updates about my stuff? A: You can submit your claim via email so that our staff can mentracking the status of your order. Q: How long does it usually the delivery of goods from the seller to the agent SuToCorp? A: Usually the goods will arrive at our agents in 3-5 business days after the seller sends it (depending on fast or slow response from the seller). Q: Can I add other items to be sent along with my stuff before? A: Yes, you can add your items as long as we still do not send your final payment. Q: What if I want to add my orders with other goods? Q: What is the ratio cost kirimnya if I order some stuff and if I order a lot of stuff? A: Usually the more severe your package, then the accumulated costs can be cheaper kirimnya. Q: When can I get the final details paymentnya? A: Once your goods up in our agent and after we finished merepackingnya. Q: After paying the final payment, When my goods be delivered? A: After you pay off your final payment, we will send your goods within 1-2 working days. Q: Will I be requesting undervalued to minimize customs duties? A: Yes we can offer undervalued and mark as gift on your shipping documents. Q: How can I know if my stuff has been shipped? A: We will inform you tracking number after we send you your goods. Q: Why is stuff I still have not been up too? A: You can try to track it down by using your tracking number. Q: Why did my tracking number can not be traced? A: You simply submit your claim via email and we'll check back with your tracking number. Q: I've tracked and stuff I've been in customs for more than 5 days, What next? A: You can visit the nearest Post Office to inquire status of your shipment with your tracking number. 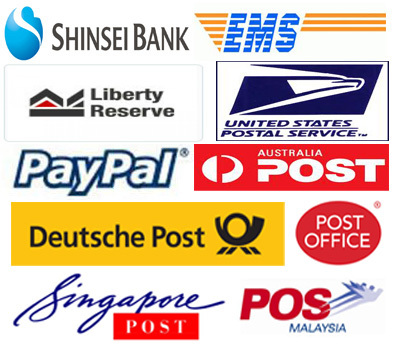 Q: I've been to the Post Office and they said I must bring proof of payment, What next? A: You can requesting invoice to us and we will send invoicenya via email. Q: Why do I still taxable items while I've asked for in undervalued? A: Because sometimes the customs and excise like to determine their own prices, so we do not guarantee that your items will be 100% tax-free. Q: My package arrived at my address but the goods are damaged, Is SuToCorp responsible about this? A: In accordance with our Terms of Service, we can not guarantee the condition of the goods from the seller (especially electronics). Q: Is SuToCorp not check his condition after the goods arrived at the agency? A: Due to many types of goods coming into our agency, agency staff so we're not so knowledgeable about the details of the goods. Q: Items that I received is not the same as what I order, How the next step? A: You can submit your claim via email and we'll help process your claim to the seller. Q: Will I be charged again if I exchange the wrong item sent? A: Regarding whether or not an additional fee for the exchange of goods, we will then confirm via email. Q: Can I get a fee is cheaper to order next? A: You can follow our membership program to get some advantage.